When it comes to discussing healthcare policy, the GOP duo is being cowardly and dishonest. Last week, in the wake of Representative Paul Ryan’s selection as Mitt Romney’s running mate, there was a rare moment of agreement across the political spectrum. Both liberals and conservatives concluded that Ryan’s addition to the ticket would make the campaign a choice between his radical right-wing vision of privatizing Medicare and block-granting Medicaid and President Obama’s desire to preserve guaranteed health coverage for vulnerable Americans. Both sides relished the fight, believing it would be to their benefit. Alas, no such thing has occurred. Ryan has a reputation for political bravery and commitment to principle, and on the campaign trail Republicans such as Virginia Attorney General Ken Cuccinelli have tried to claim that merely by picking Ryan, Romney has demonstrated he also possesses those virtues. 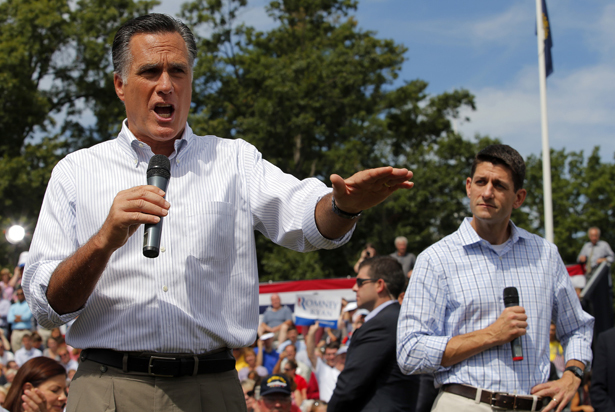 But when it comes to healthcare policy, the Romney/Ryan ticket is being cowardly and dishonest. When they give stump speeches they do not emphasize, or even mention, their radical, unpopular plans to leave seniors without adequate health coverage. Instead, the deliberately obscure the issue by attacking Obama for “raiding” Medicare to pay for the Affordable Care Act. It is nothing but a transparent pander to the GOP’s base of older voters. Unless Kristol’s “genuine cause” is to confuse and mislead the American people—always a distinct possibility—then his comment makes no sense. All Romney/Ryan are doing is trying to hide from the American public just how badly they would shred the social safety net in order to pay for giving themselves giant tax cuts. Ryan actually included the savings from cuts to wasteful private subsidies in the Medicare Advantage program that the ACA enacted—the same ones he now inveighs against in every speech—in his own budget. The reason he kept them in his budget, even while he votes to repeal the ACA and therefore would lose them, is because it gives him more breathing room. Take away those savings, and Ryan would have to come up with even more cuts to other popular programs. Having a substantive debate about how to balance the budget is something liberals and conservatives should both want. Unfortunately, the Republicans are afraid to do so.